Empowering girls is the strongest determinant of progress for every development outcome for a society—from economic growth to equity, creativity, and innovation. Yet despite the demand for technology creators and inventors, we still have minimal representation from women and minorities in STEM fields, particularly in computer science (CS). In fact, the United States only graduates approximately 56,000 students each year in CS, and only 11,000 of these undergraduates are women and even fewer are Hispanic and Black. Iridescent is a global STEM education nonprofit with a mission to empower the world’s underrepresented young people, especially girls, through engineering and technology to become innovators and leaders. For the past 13 years, Iridescent has been creating, implementing, and iterating an engineering and technology, project-based learning, mentor-supported education model. Over 130,000 students, parents, educators, and mentors have been served through their programming to date—across 100+ countries. Iridescent has two programs, the AI Family Challenge (AIFC) and Technovation, both of which introduce participants to cutting-edge technologies and empower them to solve real community problems—leveraging science for social good. The AIFC invites underserved 4th-8th grade students and their families to learn about Artificial Intelligence (AI) technology and solve a problem in their community using AI tools. 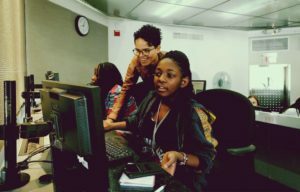 Technovation combines computer science and entrepreneurship to help girls ages 10-18 identify a problem in their community and create a mobile app business designed to solve that problem. Participants across both of Iridescent’s programs develop 21st century skills that will prepare them to be successful in the future workforce. But you don’t need to wait for the future to see the impact these girls are having already. With the tools and apps they’re developing, they’re helping individuals with autism improve their social interaction skills and reduce anxiety in times of stress. They’re strengthening the relationship between elderly patients with Alzheimer’s and their caregivers. They’re addressing literacy, improving healthcare access, reducing poverty and unemployment, and fighting pollution. Want to join Iridescent in mentoring and empowering the next generation of innovators and leaders? (We should warn you that you risk feeling personally empowered and have an increased likelihood of reporting improvement in your own leadership, communications, creativity, and collaborative abilities.) Click here to learn how you can partner in the delivery of exciting, cutting-edge, hands-on engineering and technology programs. Or click here to give a tax-deductible gift that lasts a lifetime. 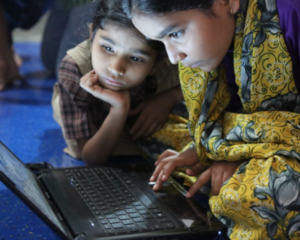 Iridescent’s goal is to reach $150,000 in individual donations—enough to support 3,000 families in the AI Family Challenge or 1,500 teams of girls in the 2019 Technovation Challenge. Can you even begin to imagine the difference-making, world-changing impact that group of girls and families could make?